Since the recent financial crisis of 2008, the term stress test has received a lot of attention among financial market professionals and the general public, primarily due to increased regulatory and central banking scrutiny of large banks and other systemically significant financial institutions. This type of stress test sought primarily to test balance sheet resiliency and sufficient capital reserves in the event of a major market break. What follows is not a discussion about balance sheet resiliency. This document provides an overview of the methodology behind the development fund- and portfolio-level stress testing capabilities within the MPI Stylus Pro application. Our research team has also published a series on portfolio risk using investment risk analytics functionality released in Stylus Pro v11.4 to demonstrate how historical and forward-looking stress tests can provide deeper insight into fund performance across various market regimes and hypothetical scenarios. The term stress test, as it relates to the work that MPI does with asset allocators, consultants, asset managers and financial advisors, seeks to determine how well individual funds and portfolios might perform under different regimes and scenarios. Given the complexity of such investments and the magnitude of the shocks performed in these types of stress tests, this kind of risk analysis can help uncover significant exposures to undesired market factors. This form of stress test helps investors to be aware of and prepare for potential up or down-market surprises. Fund sellers can also utilize stress testing to better position their funds in a highly competitive marketplace. Stress testing aims to quantify the impact of an event or a series of events to a fund (or portfolio). The event may be hypothetical and refer to something that hasn’t been previously observed in the markets. It may also reflect past market experience and result in asset price movements that correspond exactly to real price movements during a certain historical time period. The end result is a return or distribution of returns that reflects how a fund or portfolio might perform should a given scenario take place. 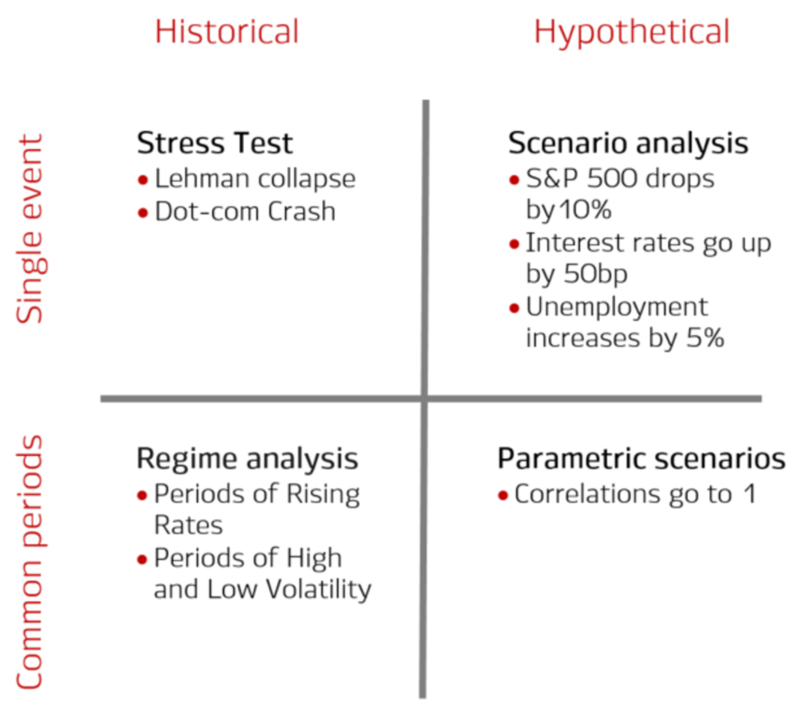 The practitioner’s focus in stress testing is on the future, even if the stress scenario mirrors historical events. We classify stress tests in four quadrants, as seen in the above table. Note: Parametric scenarios will be offered in future versions of Stylus Pro. Alternatively, you may want to focus on historical periods based on various rules or conditions that may have existed, commonly referred to as regimes, in order to calculate summary statistics (not just a single point estimate). For example, the collection of all months in which the S&P 500 experienced positive monthly returns constitutes an historic regime. In this example, each month in which the rule was met (a positive S&P 500 return) is identified and used to define the specific periods that represent this regime. The returns from these specific months are then used to calculate betas, standard deviations, Sharpe Ratio, VaR and other statistics. Whether we are focused on historical stress tests or regimes, we are still looking for periods of interest from a common viewpoint, for example, oil supply or demand disruptions, government interventions, market volatility due to irregular trading activity, or distinct macro-economic patterns to name a few. Historical stress tests are readily available and don’t require assumptions around the common behavior of asset classes. Therefore, they are easy to employ, though care has to be taken to ensure that the conditions they reflect are applicable to both a fund’s current strategy and current structures in the economy. 1) they are not constrained by limited historical data, particularly over periods in the distant past for which fund data may not be available to calculate historical stress tests. For example, the last time the S&P 500 lost 20% or more in a single month was during Black Monday in1987–most funds were not around then. 2) they offer more flexibility in defining a scenario that conforms to current macro-economic conditions and market concerns, such as a trade war, inverted yield curve or China hard landing. 3) they allow you to examine how current fund or portfolio factor exposures might behave in stress environments. Historic stress testing is locked into the historic investment performance and associated exposures. Please register or sign in to download the complete 20-page MPI Portfolio Stress Testing Methodology document, which provides an in-depth look at the advantages that historical and forward-looking stress tests can deliver over other risk measures. This document also provides more information about the stress testing capabilities available in MPI Stylus Pro.